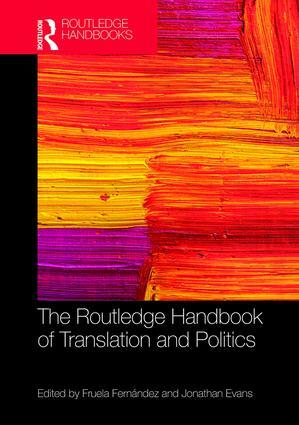 The Routledge Handbook of Translation and Politics presents the first comprehensive, state of the art overview of the multiple ways in which ‘politics’ and ‘translation’ interact. Divided into four sections with thirty-three chapters written by a roster of international scholars, this handbook covers the translation of political ideas, the effects of political structures on translation and interpreting, the politics of translation and an array of case studies that range from the Classical Mediterranean to contemporary China. Considering established topics such as censorship, gender, translation under fascism, translators and interpreters at war, as well as emerging topics such as translation and development, the politics of localization, translation and interpreting in democratic movements, and the politics of translating popular music, the handbook offers a global and interdisciplinary introduction to the intersections between translation and interpreting studies and politics. With a substantial introduction and extensive bibliographies, this handbook is an indispensable resource for students and researchers of translation theory, politics and related areas. "Evans and Fernández have gathered together an impressive array of essays, showing how the universality of politics understood as relations of power are materialized in and through their translation into specific domains. While modestly referring to their work as a 'handbook,'" this volume is also a necessary map to a critical understanding of the global history of the present. It is sure to attract a wide-readership not only within the discipline of Translation Studies but across all other disciplines and beyond the academy." Fruela Fernández is Lecturer in Spanish Translation at Newcastle University. He is the author of Espacios de dominación, espacios de resistencia (2014) and is a practising translator. Jonathan Evans is Senior Lecturer in Translation Studies at the University of Portsmouth. He is the author of The Many Voices of Lydia Davis (2016).